Everything we do requires energy. Whether we are walking the dog, running to catch a bus or sitting reading this article, the cells in our body constantly need energy to work and stay alive. Nearly all our cells contain small structures known as mitochondria, often referred to as the ‘batteries’ of the cell, which are responsible for generating this energy from the food we eat. In most people, the mitochondria work perfectly well and provide all the energy required for our bodies to function. But if the mitochondria do not work properly, and the energy supply begins to fail, this can lead to a serious condition known as mitochondrial disease. This is a broad name for a group of diseases that can affect nearly all the organs of the body but tend to target those with high energy demands, such as the heart, the brain and the muscles. Mitochondria have their own small piece of DNA, known as mitochondrial DNA (mtDNA), and genetic changes (mutations) in this mtDNA can result in mitochondrial disease. We all inherit our mtDNA from our mother, and so if a woman has an mtDNA mutation, there is a significant risk she will pass this to her children. The risk is very difficult to predict, however, as the level of mtDNA mutation that is passed on can vary. This, coupled with the fact that there is currently no cure for mitochondrial disease, means that women with an mtDNA mutation often seek advice to reduce the risk to their children. Reproductive options are available for women with mtDNA mutations. But for those wishing to have a genetically related child, the use of established techniques, such as prenatal testing or preimplantation genetic diagnosis, may not always be suitable. It was this that motivated the now Professor Sir Doug Turnbull to begin developing a novel IVF technique to prevent mtDNA mutations being passed from a mother to her child. 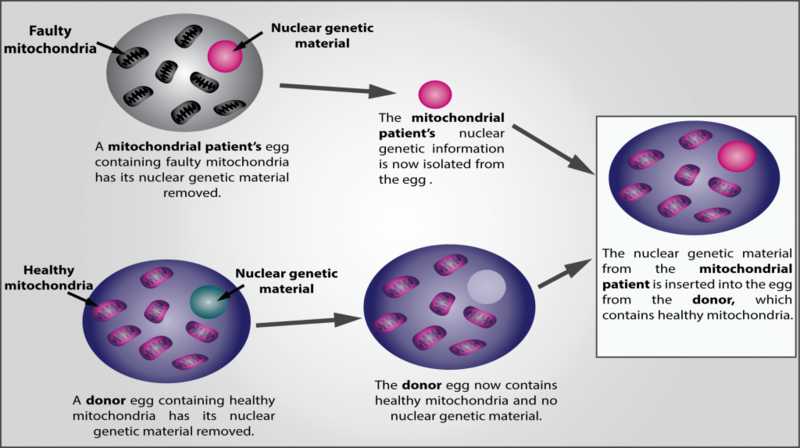 The technique, known as mitochondrial donation, involves removing the nucleus from an egg that contains faulty mitochondria and transferring it to a donor egg that contains healthy mitochondria (possible diagram?). This will result in an egg that contains all the nuclear genes from the prospective parents, which include all the characteristics we recognise in our children such as hair colour and eye colour, but with a much lower risk of mitochondrial disease. Research into the use of this technique to prevent mitochondrial disease started back in 2001 and now, almost 16 years later, transition into the clinic is imminent in the UK. This is not only because the science continues to suggest that mitochondrial donation will reduce the risk of mitochondrial disease, but also because the law has been changed to allow the technique. As with the scientific research, the law change is something that has taken place over many years. The extensive process was a huge team effort that involved many different people, but most importantly, the patients, their families and the patient organisations. By working together, we were able to provide a valuable insight into the reality of mitochondrial disease, and the justification for a technique that could reduce the risk of disease, whilst also discussing the science. The patient voice was one that was listened to and we truly believe this is why, when the votes took place in the Houses of Parliament in early 2015, there was overwhelming support to allow mitochondrial donation. Following publication of the most recent scientific review on the safety of mitochondrial donation in November 2016, the regulatory body (the Human Fertilisation and Embryology Authority) approved the clinical use of mitochondrial donation in December 2016, making the UK the first country in the world to formally allow the technique. This means that the team in Newcastle can now apply for a licence to perform mitochondrial donation. Licence applications will need to be submitted for each patient and will be considered on a case-by-case basis. The aim is to perform mitochondrial donation for around 25 carefully selected patients each year and it is hoped that 2017 will see the first of these coming through the clinic.